Only the second pocket shark ever seen by humans was discovered by scientists during a study conducted by the National Oceanic and Atmospheric Administration. 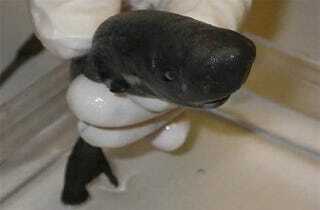 The first pocket shark find was 36 years ago off the coast of Peru, and there hasn’t been another one seen until now. The tiny [creature] was among a group of fish caught during a NOAA study in 2010 near Louisiana. The fish were then frozen to study sperm whale feeding. Scientists have been slowly sorting through these frozen fish for the past five years. Upon discovering a “remarkable pocket gland with its large slit-like external opening located just above the pectoral fin,” NOAA biologist Mark Grace realized this was not just another ordinary fish, as detailed in his Zootaxa research paper. It’s not clear what exactly the shark’s pocket gland is used for, but scientists think it could be for releasing pheromones, based on previous research of similar species. The pocket shark’s scientific name is Mollisquama, and although at only 5.5 inches long you could theoretically fit it in your pocket, its common name actually comes from this gland. NOAA Ocean Service genetics expert Gavin Naylor was able to determine that the pocket shark’s closest relatives are the kitefin shark and the cookie cutter shark, who are fellow members of the Dalatiidae species. While they will often eat smaller sea animals whole, when looking for food, most Dalatiidae will chew out an oval plug of meat from larger creatures. Grace acknowledged that while the pocket shark discovery is very exciting, it’s also a reminder there’s still much to discover about the millions of creatures that live in our oceans. This article by Molly Fosco originally appeared on Discovery News. It has been republished with permission.